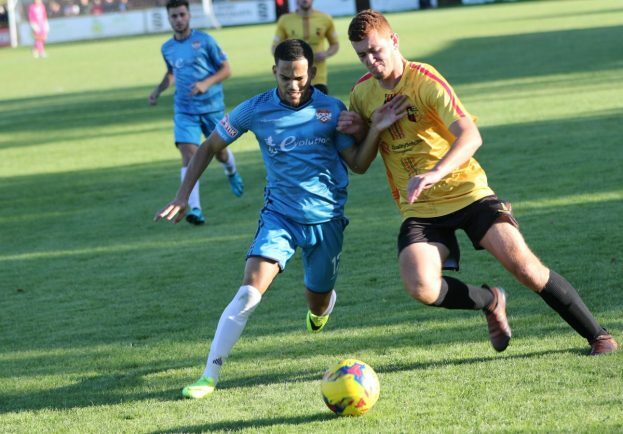 Alvechurch's Taylor Morrison, right, in action against Kettering Town. Picture by Steve Evans. 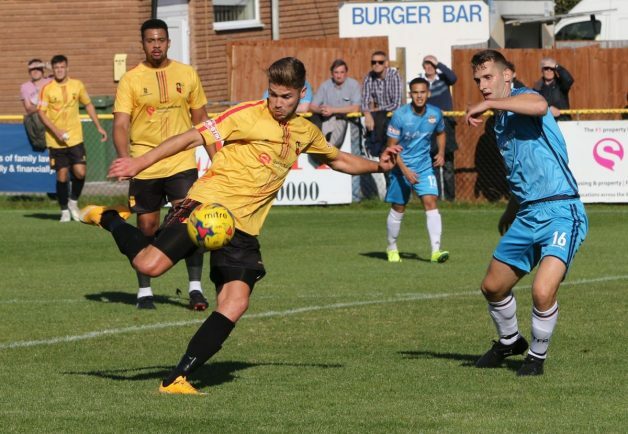 Danny O'Callaghan fires home for Alvechurch against Kettering town. Picture by Steve Evans. 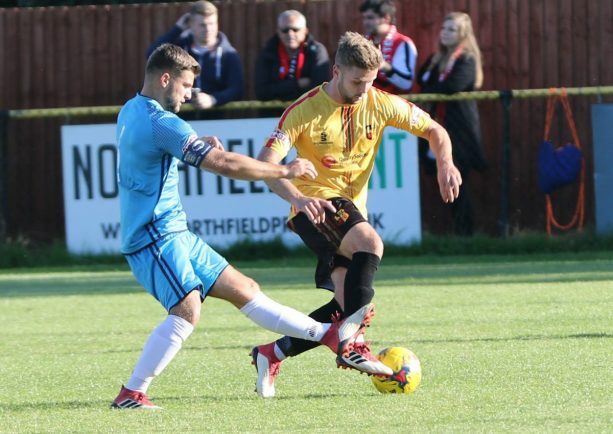 Aaron Lloyd on the attack for Alvechurch against Kettering Town. Picture by Steve Evans. Tom Turton looks to push forward against Kettering. Picture by Steve Evans. 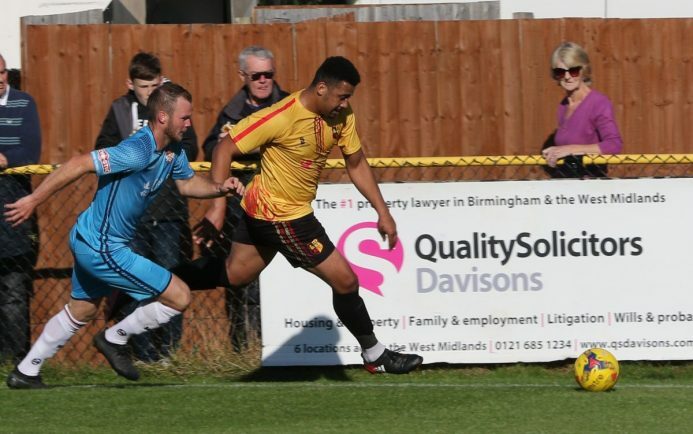 IAN LONG is looking to add to Alvechurch’s squad after stressing they remain a ‘work in progress’. The Church boss says he has been generally pleased with the start to the club’s first season in Southern Premier Central, despite successive defeats. However, after the exits of Trea Bertie and Aaron Birch, Long says they need to add to the squad and he is hoping a new signing could be on board before the trip to Barwell on Saturday. After conceding seven goals in two matches – losing 3-1 at home to table-toppers Kettering Town on Saturday despite Danny O’Callaghan levelling matters to follow a 4-1 FA Trophy KO to Corby Town – the Lye Meadow boss is also aware they need to learn some tough lessons in defending. “In the first half against Kettering I thought we edged the territory and the possession but we went in 2-1 down,” said Long. “There were plenty of positives from the first 45 minutes but games are played over 90 minutes. “We didn’t help ourselves with the goals we conceded. We made some bad mistakes which were real schoolboys errors. It was a sloppy first goal, the second was a soft penalty given against us and then the third was a real mix-up. “It’s been unlike us because we have defended well generally since the start of the season. Alvechurch will, however, expect to have midfielder Ryan Winwood back in action to face Barwell. He has been missing for the past seven games with a hamstring injury. Church then welcome Highgate to Lye Meadow on Tuesday for their opening match in this season’s Birmingham Senior Cup. Long hinted he will use the tie as the chance to give some of his younger players a chance to impress. Long, however, will be on international duty for the tie, having been handed a role with the England C team to face Estonia on Wednesday. Long, who had a similar ‘gofer’ role last season, will help behind the scenes in preparing the team for the game at Leyton Orient. Rich Colwell will take charge of the Church team on Tuesday.